I’ve had a hard time deciding what to write lately. And not because there’s been nothing going on, but rather, because EVERYTHING is going on. I’m not even sure where to begin, except to say that since the first of the year, I’ve been a student in Sarah Petruno’s Shamanic Healer Training Program. And as it turns out, energetic healing is hard work. I wasn’t sure what to expect from this class. I’ve been meditating for at least a decade, talking with my guides for the better part of five years, and journeying on a regular basis for a year and a half but I don’t think I was fully prepared for the experience I would have over the past 15 weeks. 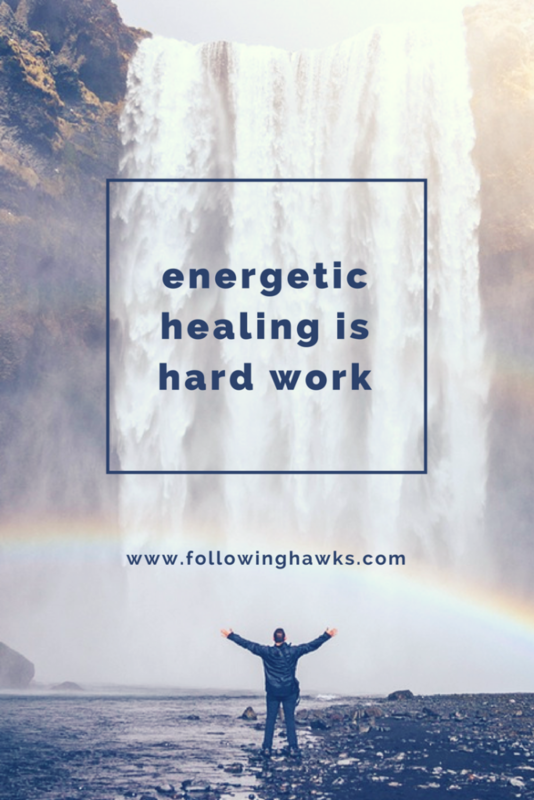 If you do any kind of healing work, including reiki, which I’ve also been attuned to, you know that as the source energy flows through you, you also receive the healing energy. Doesn’t that sound lovely? But the key word here is healing. And healing can be hard work. So, since the first of the year, I’ve not just learned how to do energy scans, soul retrievals, spirit attachment releases, and full shamanic healing for clients. I’ve experienced it ALL for myself, in a very short period of time. It’s a little like having spiritual surgery week after week. And spiritual surgery comes with some very physical side effects. I went down with the worst head cold I can remember in years about two weeks ago. It all started in February. I made an appointment for an akashic records reading from Meghan from Good Earth and Soul because, you know….I needed one more thing on my plate. It was kind of an impulse on my part, which in retrospect I’m sure it was a big shove from my guides. Prior to my appointment, I had been doing just fine in class, although I didn’t feel like I was getting as much information from my guides as some of the others. But, we’re all on our own unique journey so I didn’t question it much. In my akashic records reading, I learned that I was part of a caretaker soul group and that I have a gift of divine compassion that I’ve carried with me in all of my lives. However, for a compassionate caretaker, my style is more “tough love” than you might expect. I can help people to understand their issues, but I’m not one to coddle and I express myself with actions more than emotions so sometimes people don’t understand my kind of care and compassion. Uhh, yeah. That describes me EXACTLY. She went on to explain that she found four bindings on me from a past life where I had uncontrollable clairvoyant gifts. Bindings from past lives keep us from making the choices we want in our current life. You know when you KNOW you want something to be different but you just can’t seem do DO it? That can be the result of a binding that you have no knowledge of from a past life. All four of these bindings were on my 3rd eye – restricting me from getting my own information from spirit. Well….that would explain a few things! She assigned me a 21-day transmutation of energy that required me to light a candle, tune in, and recite it out loud, asking for the bindings to be removed. She said that some people start feeling energy move right away when doing this work, other people felt changes as the 21 days progressed and some people felt nothing but started seeing changes after the transmutation was complete. I felt some buzzing in the area of my 3rd eye within a few minutes after the first day, but nothing particularly remarkable after that. Fast forward two weeks, and I am selected as one of the people in class to receive readings and healing from the other students. That’s cool, I think to myself…and submit my question. The next two days, I feel mildly ill and feverish. I force myself to do the spirit attachment release meditation that was assigned for the week and it included a deep healing from my guides at the end. I felt immediately, physically healed. Hmm. Thanks guides! Sunday, Monday, and Tuesday pass and all is well. I’m thinking nothing of the six people all reading and healing my energy, never mind the recovery time from the weekend’s session. And then I wake up on Wednesday morning feeling AWFUL. I call in sick to work, lay around all day, but am convinced I will be well the next day because I NEVER get sick and when I do I recover quickly. Thursday comes, I feel even worse. Friday is a bit better and I manage to do the reading I’ve been assigned for the week and email it off to Sarah. It’s like the final pieces of whatever was still hanging on from the bindings were getting kicked to the curb on the same few days the class was sending me healing after healing. And I literally couldn’t lift myself off the couch. My energetic (and physical) purge continued for another handful of days but I’m finally on the mend. As my class comes to a close, I need to decide what the next step is. I can start officially offering healing services, if I so choose. If there’s one thing I have learned these past four months, it is how unique and special each person’s healing energy is. As a group, we often pick up on similar major themes with one person, but each of our guides gives us different instructions and information that’s specific to our abilities and is exactly what is needed at a given time. This is part of why you will get such different readings from different practitioners. It is the information your guides are giving them at that moment in time, that you most need. Also – if this kind of in-depth learning and healing is interesting to you, the next session of the Shamanic Healer Training Program is enrolling now for August. Grab your spot before the class is full.